I was rooting around in one of the boxes in the garage and found this shiny piece of red fabric. There is a story to how I came to own this fabric, but that comes later. I thought to myself, “A cloak for my little girl. She can pretend she is a princess or a queen”. A fitting end to the story of this fabric that I have kept all these years. 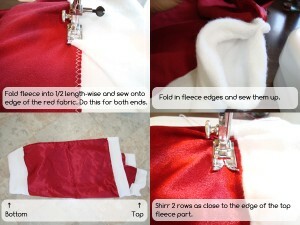 Use an over-edge stitch on the edges of the red fabric to stop it from fraying. Hem both the side edges. Fold one of the fleece pieces into 1/2 lengthwise sew to one edge of the red fabric. Fold the other fleece piece and do the same to the other edge. Tidy up the fleece edges by folding in the excess fabric and sewing the seams shut. 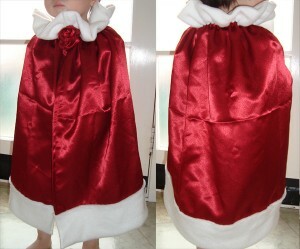 The narrower white fleece strip is the top of the cloak. Shirr 2 rows very close to the top white fleece edge. In hindsight, sewing normally and then gathering the fabric would work too. Sew on a press stud button. In 1999, I was doing 2nd year design papers. One of the projects called for us to design a shoe. Now, bear in mind that after 4 years of business & management papers, the brain gets very rusty in a creative sense. We had tutorials each week leading up to the deadline of the project. We had to participate and talk about our “shoe” and show our sketches and ideas to the group and the tutor. In the first tutorial, I said, “I don’t know and don’t have any ideas”. The 2nd and subsequent tutorials: I showed half-hearted, pathetic sketches with notes on a few pages and not much else, and the tutor kept telling me week after week to “think outside the box”. Note: By now, all the other students had ideas of what they were going to make/sculpt/create and were starting to gather supplies and make prototypes. There were robot shoes, a concrete shoe, some really futuristic knee high boots, etc etc etc. About a week to the deadline, I was panicking. I had not come up with any new ideas, and it was going to be my turn to speak to the group soon. Then, I had a brainstorm. My turn came, and you could almost hear everyone think, “Here we go again”. Me: I’m going to design a non-shoe. Tutor: What do you mean by that? Me: Have you heard the story called the Emperor’s New Clothes? Me: Well, the tailors tricked the Emperor into thinking that they made him clothes that only clever people could see. In actual fact, they did not do a thing. So I am going to design the Emperor’s New Shoe. I am thinking at this point that I will get a big fat zero for this project. The brief calls for a shoe – a tangible, visible shoe. Tutor: The idea has merit. Think on it some more. You still have some time. Okay… he didn’t shoot the idea down, but he didn’t sound too convinced either. I was thinking this is cool, I might be able to get away with not making a shoe. The next few days saw me scrambling to get a pedestal made from plaster, red and gold fabric and notions. I even made a flag/wall-hanging for good measure. I had to display my “invisible shoe” after all. We had a few hours to set up our projects on the due date. This was where I made a huge mistake (because I didn’t do any trial set-ups at home first). Instead of indenting the fabric on the pedestal to make it look like a shoe was sitting on top, I dumped leftover plaster powder on top of the shiny red fabric on the pedestal and made a very messy shoe print. By then it was too late to change anything. I had run out of time. I also remembered too late that I should have gotten the storybook from the library and put that on display too. If they gave me marks for not following the brief and making an actual shoe, they must be crazy. My non-shoe earned me a “B” and the accompanying comment went something like this, “The plaster powder was a mess, but great thinking outside the box”.